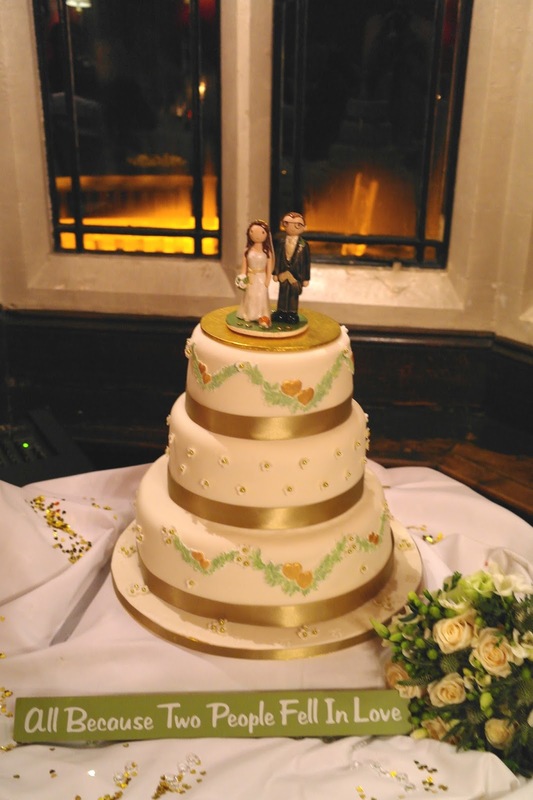 I was sent these lovely photos this week, of a wedding topper on the cake, and had to share the amazing wedding cake idea. Lovely post today, a thank you card and photo of the topper on the wedding cake. Winter is on the way….. There is a definite hint of winter today, lots of wind and rain and a chill in the air. With a winter wedding you aren’t guaranteed the lovely frosty photos but you are guaranteed that lovely cosy warm feeling when you and your guests are all snug inside. The perfect opportunity for lots of fairy lights and an open fire. 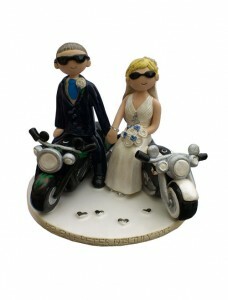 This topper is for two bikers, his and hers motorbike cake wedding cake topper! 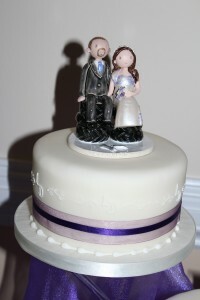 Love this fun cake topper idea, I have made a few now. 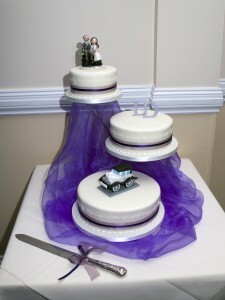 The bride and groom are sat on a stack or tyres and there are a few tools scattered on the base. 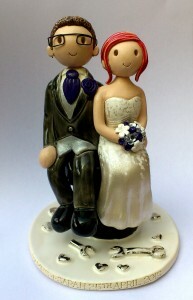 I love the brides bright red hair as well, a great personalisation on the topper. This is a topper where they were sat on seperate tyres, but still had the little mechanic tools on the base. 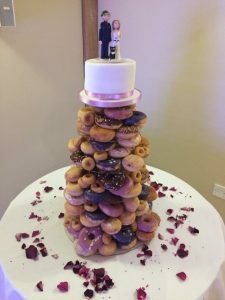 I love the idea of a winter wedding, it conjures up images of crisp white snow, roaring log fires and a lovely magical white sparkle over everything! This beautiful cake ticks all the white sparkle theme, including silver snowflakes, it’s so pretty. 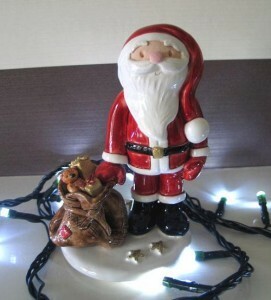 This Christmas topper was made just as a Christmas ornament! It could be used for a cake topper, but was made just to sit on the fireplace. 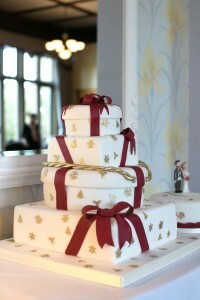 I love this wedding cake, it is perfect for a Christmas wedding. With the red, white and gold it is such a striking design. 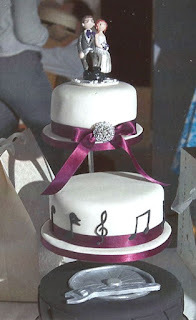 The topper is sat on it’s own matching cake next to this one. 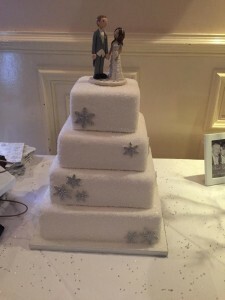 This was such a fun design to make for a winter wedding. 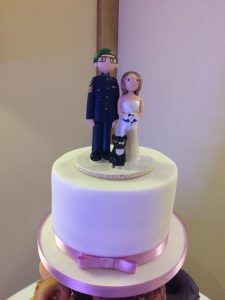 A snow angel cake topper! I love that the bride is wearing earmuffs. 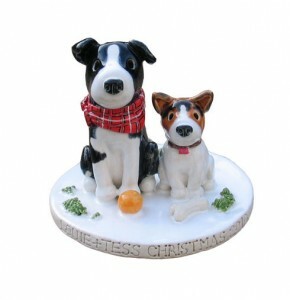 A popular range at Christmas is the pet toppers, a perfect gift for pet owners. A little pottery ornament of their pets, made to match, that they can keep forever. All these cake toppers are from Atop of the tier – www.wedding-cake-toppers.co.uk and all made by Kate Elford. 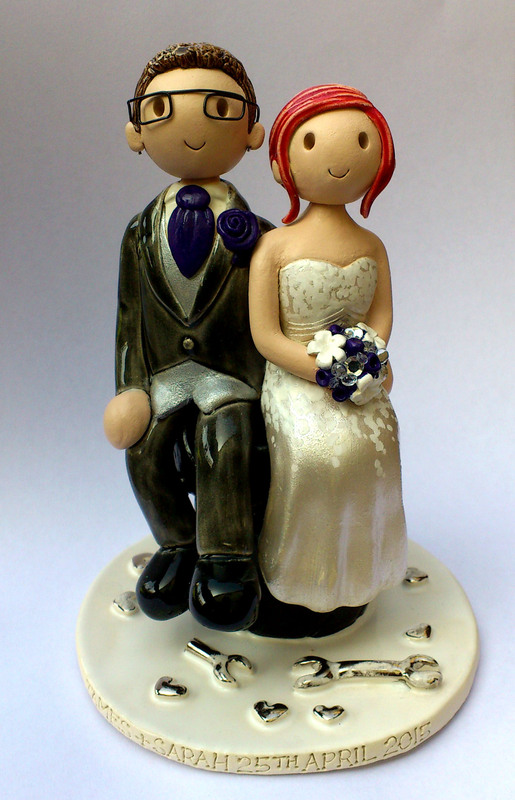 They can be made for weddings, special occasions, or just as a Christmas gift. 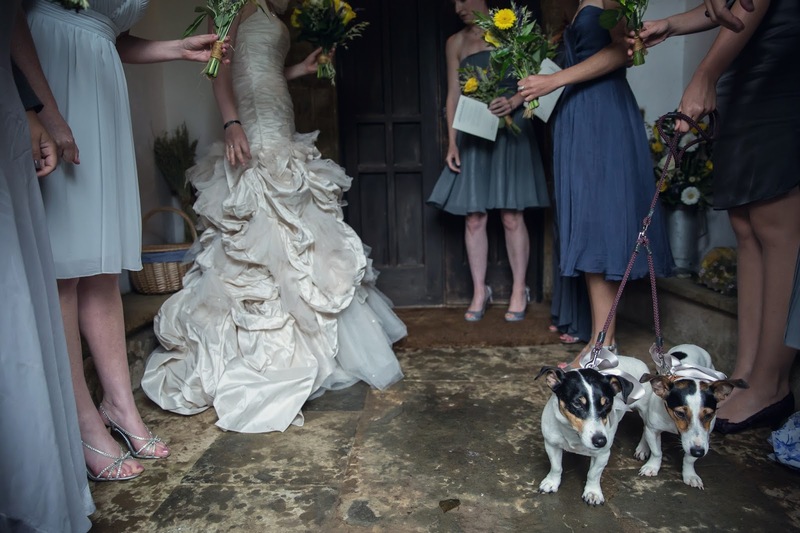 I’ve been sent these lovely photos of Nelly and Nora, the Jack Russell wedding guests! I created mini replicas of them in clay after they were ordered for the wedding cake, here is a photo of them with the cake, including some little sheep! 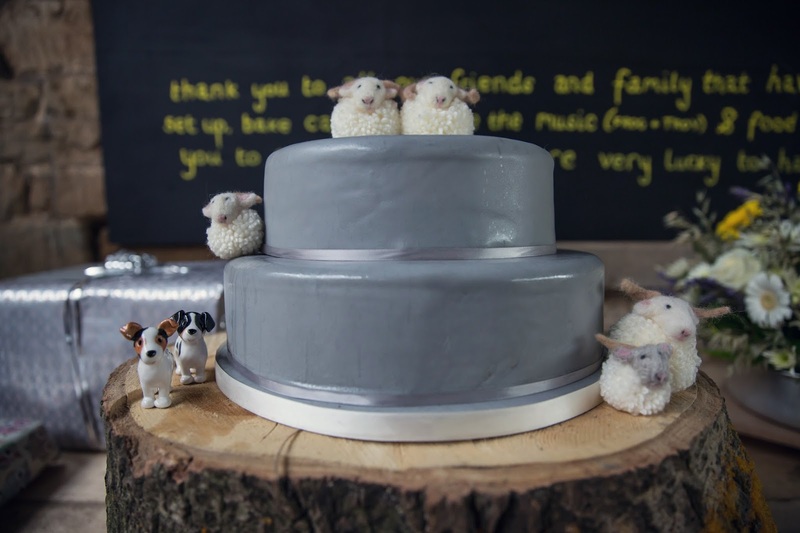 (sheep aren’t by me) I love the silver wedding cake with the tree ring cake base, it looks a really natural wedding theme. 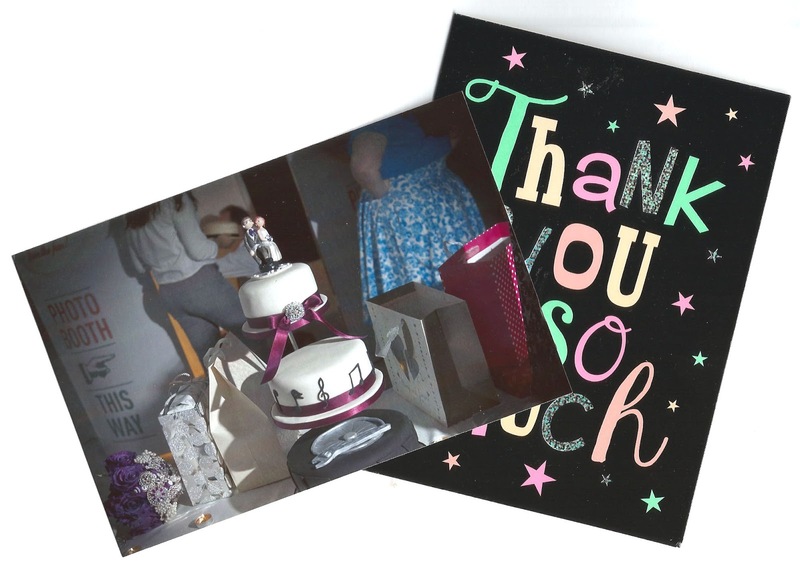 Just a quick thank you for our beautiful Nelly and Nora who looked perfect with our wedding cake – we love that we can keep them forever. 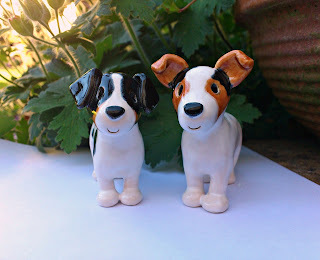 They are perfect miniature replicas, you are so talented, thank you!